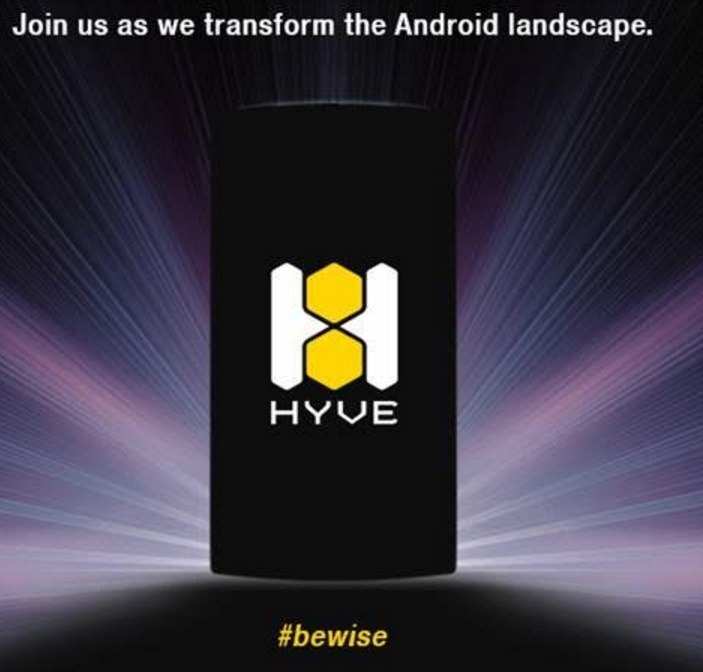 Hyve launched its first two Smartphones in the event 1. Buzz & 2. Storm. Show started with the entry of Mr.Sharad Mehrotra on the stage who addressed all the attendees. First of all he introduced himself and his Co-Founder-Companions. 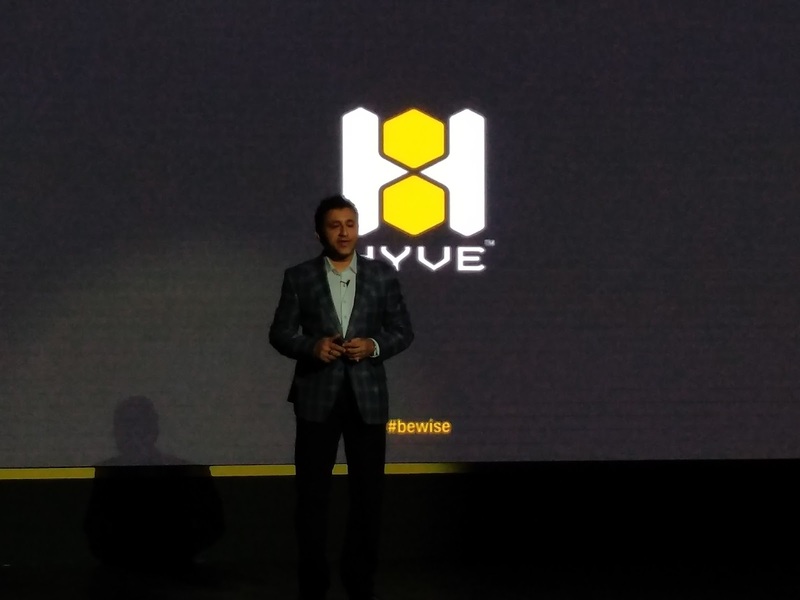 He also talked about his and his Co-founders long journey & experience to reach the to the HYVE. He clearly mentioned his company’s moto & working policies and said that we are here to promote and take initiative of Govt.Of India’s Digital India and Make In India movement and we will work towards quality products and better After Sales Service to its customers. He also emphasized to work hard to gain customers trust and happiness & satisfaction through its working. He talked about its products and said that we want to provide best deals products to our customers. 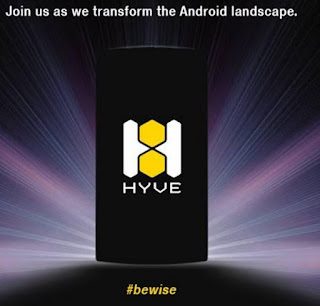 Hyve Buzz has 5.5” screen @ 1080p FHD resolution and 2.5D Arc Glass on top of it, which is enabled with Media-Tek Mira-Vision™, it enhances picture quality by providing better sharpness, color and dynamic contrast to significantly improve overall user viewing experience. It also has Oleophobic coating on its display screen and Anti skid & scratch resistant back panel. Smartphone has Media-Tek Chipset MT6753 with 1.5 GHz. Octa Core Processor & MALI T720 GPU with support of 3GB of RAM and 48GB of inbuilt storage it also has an expansion slot which supports upto 144GB which is an ample of storage for any type of Media - Pictures - Movies - Music - Apps and User Data. It is a Dual Sim phone with dual standby over both FDD & TDD 4G LTE bands it also has new of VoLTE feature for Enhaced Voice Call Quality. It has 13megapixel Camera with Dual Led Flash & Dual Pixel for low light imaging on its back and 5megapixel Frong facing Camera both with Sony Exmor RSTM Sensor. Hyve Buzz also has (Fingerprint) Biometric Security with Touch2CallTM (Touch2CallTM is a patented technology wherein the user can scan his/her various fingers to different pre-defined numbers for one touch calling. Say, e.g. If one configures his/her ring finger to his/her spouse, touching the ring finger in even sleep state will unlock the phone and dial the number of his/her spouse). It has 2500mAh TruLife™ Battery for which makes phone run for a long time. It comes with fast charging technology over reversible USB Type C port with fast charging support. Some other features are AquaRes™ Water resistance this phone is also has water resistance- IPX 4 rating. Other features are Bluetooth 4.0, Wifi 802.11, GPS and inbuilt pre-installed FM Radio app. and 3.5mm Jack. Phone has some useful Sensors like : NFC, Accelerometer, Gyroscope, Proximity Sensor, Compass, Built-in Delayed messaging feature, Illuminated notification light (Hexagon shape like bee-hive ) It runs on Stock Android 5.1 Lollipop operating system Hyve promised to provide an update for the device for latest Android OS 6.0 Marshmallow, phone is CTS Certified, GMS licensed. 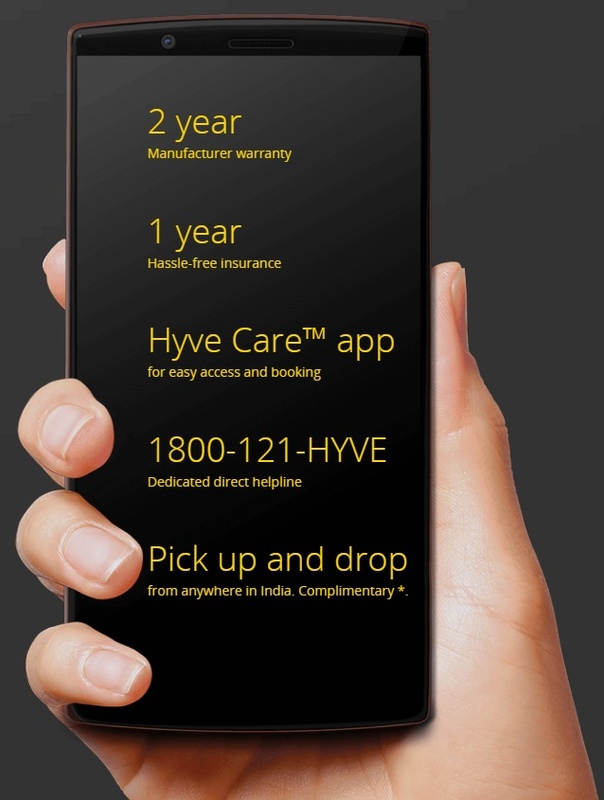 Company has announced this phone with 2 years standard warranty with 1 year pre-bundled insurance for damage protection to gain customer satisfaction & delight. 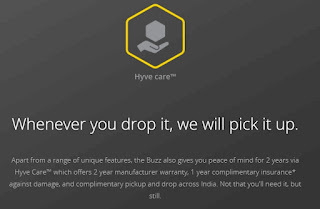 Hyve also decided to provide Complementary Pick & Drop Service across 42000 Pin Codes across the Country. IVR - Free Call Centre Support. 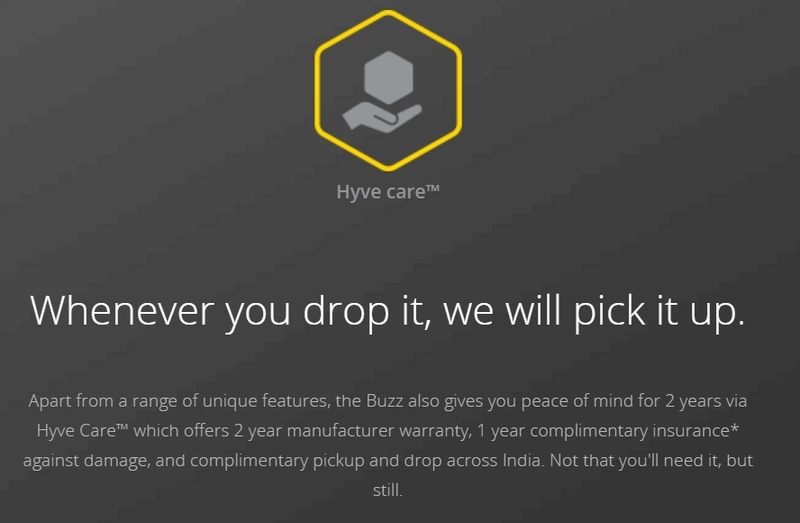 Access to Hyve Care™ portal & App with single sign-on benefits. Ergonomically placed volume and power button for easy access. HYVE Buzz has Unique Curved design for firm grip. High quality USB C Braided Cable. Dimensions of the Phone : 151 x 78.2 x 10.3 mm (5.3 mm on edges) Weight: 154 gm High quality packaging. It is available in three colors Twilight Black - Midnight Blue - Sunset Wine in the price of Rs. 13,999/- online sale will start from 22nd of June. Storm is Dual Sim - Dual Standby, 5 inch 720p HD Screen display. It is also supported by both 4G bands - FDD & TDD LTE. It has Metal Bezel Design. 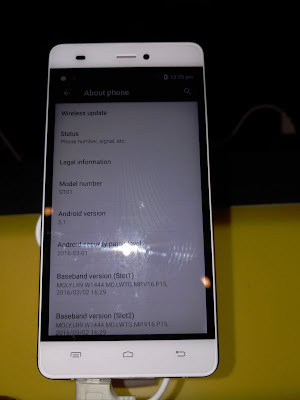 On hardware side it has MediaTek MT6735 1.3 GHz Quad Core Processor. Phone has 2GB of Ram and 16GB inbuild storage with Expansion Card Slot upto 80GB. Its 5inch HD display is Enabled with MediaTek MiraVision™, which helps for Enhanced Picture quality by providing better Sharpness, Color and Dynamic Contrast to significantly improve overall user viewing experience. It has 13MP Rear & 5MP Front Camera with ISOCELL & PDAF technology with latest Samsung 3L8 sensor. In battery section it has 2000 mAH TruLife™ battery. It supports phone to run for a long time as it is Purely Stock Android based device having no bloatware or uneccessary battery comsuming junk in it. 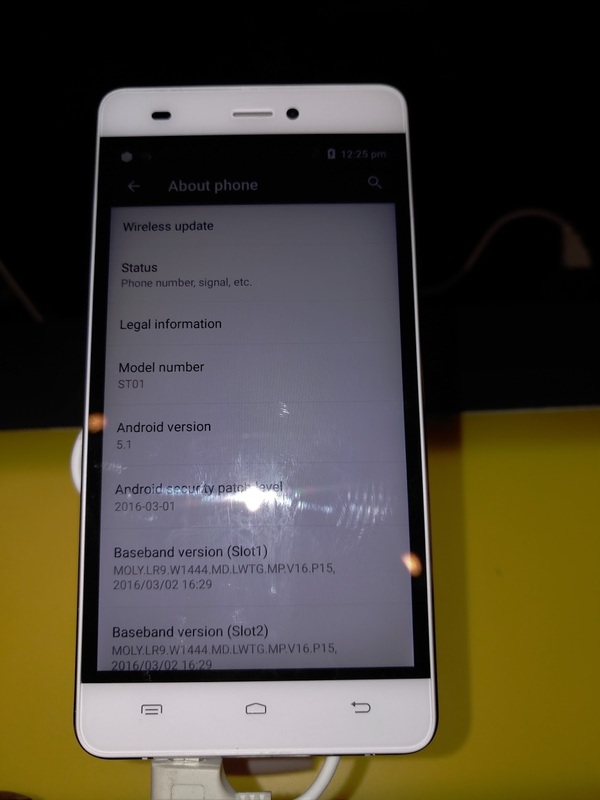 On other feature it also has pre-installed FM Radio App, Bluetooth 4.0, Wifi 802.11, GPS and same as Buzz it also has Built-in Delayed messaging feature. 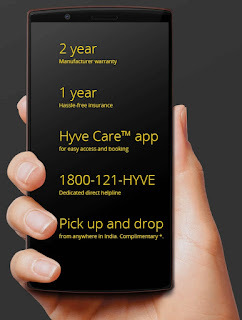 It comes with Google provided Stock Android 5.1 Lollipop operating system which is upgradable to Android Marshmallow 6.0 which is Hyve CEO promised to provide very soon, it CTS Certified, GMS licensed .
. Access to Hyve Care™ portal & app with single sign-on benefits. It is available in two colors Snow White & Mystic Grey. Price of the Storm smartphone is Rs. 8,499/- only and will be available for online sale from 22nd of June, 2016.